The beginning and the End …. The Alpha and the Omega …. OK, so this might be a shock to some folks out there, who shall probably consider such musings as heresy, but NO. It is NOT your “amplifier” that is playing the music. It is the Power Supply that does. 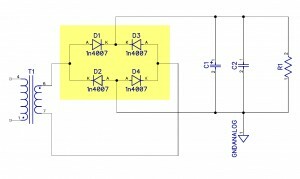 What is actually an “amplifier” ? providing power to your speakers. So this is that what this section is called ? Is that what I am “supposed” to be writing about ? If indeed – where is a good starting point ? I suppose that the best place to start … is to start at the beginning. By the end of this article, you will be executing your first DIY project. You will be investing a total amount of ONE EUR and purchasing. Purchasing one or five capacitors, which you will be soldering into your equipment. Even in your most expensive piece of hardware, since, … these capacitors may simply not be there …. At the very beginning – we have a power supply. And guess what – at the very beginning of the very beginning – there is a ….. YES !! correct. ….. There is a rectifier. a “this” topology or a “that” topology. Let’s leave the rambling to the teachers. But we want some action out here ! statistically in about 99% of the cases of any and all audio devices …. … is a simple, plain vanilla, four legged silicon bridge rectifier. there is something so trivial and boring as a Graetz rectifier bridge ? This is a simplified view of a common circuit that is present in almost 99,99% of all audio devices out there. Be it cheap low market stuff, or even the most expensive devices – they all tend to use some form (identical or “similar”) of this circuit. Boring, you say. “It is a typical circuit”. 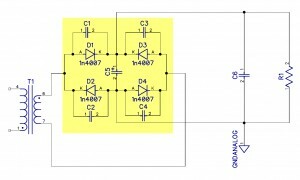 A typical circuit means typical problems and typical SOUND. Have a closer look between the “thin” lines again. Did you know, that these diodes DO NOT CONDUCT AT ALL ? Statistically speaking ? Statistically, they do conduct any longer than 1%, or maybe 3%, of the available cycle time. FOR THE REST rest of the time, THEY DO NOTHING. For 97% of the time, your amplifier is running from the energy stored in the filter capacitors. …. the longer is the time that the diodes DO NOT CONDUCT AT ALL and you run solely from the caps. The catch here is …. when they DO conduct, they do so with a big SLAM. so the percentage of time where the voltage from the transformer and rectifier is “higher” than that on the caps decreases. 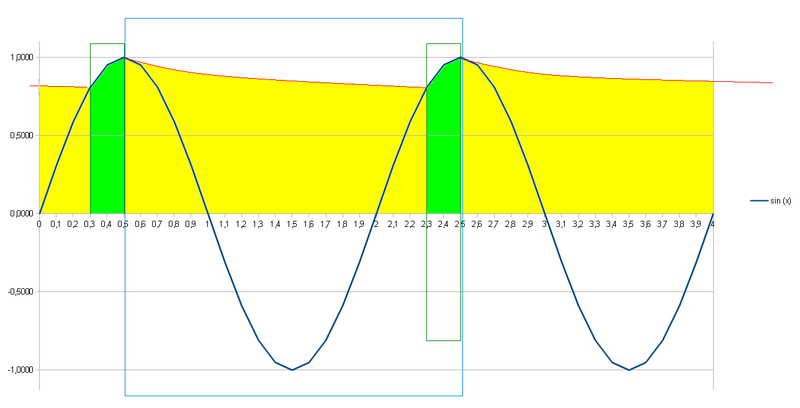 On the graph above, you can see that the diodes actually conduct within a short time-frame (the “green” area) – only when the voltage of the sine wave is higher than the voltage remaining on the slowly discharging capacitors … But the whole “yellow” area – the sine wave is “below” the red capacitor discharge line, so the diodes CANNOT conduct – and this is a state of fact for MOST of the time. For sake of clarity of concept presentation, I showed this as a ~10% conduction window time-frame, but true time frames of conduction are typically less than that. Indeed, the more beefy your capacitor fiter bank, at any given load, the shorter the conduction time. But boy, when they DO conduct, they do so with a big slam, so as to catch up with the … backlog. Now, consider this simple mathematical exercise. Imagine (for examples sake), that your beefy amplifier is a current hog (like an A-Class device, for examples sake), and that it is constantly pulling a current of say 1 Ampere from the power supply. All the time. When I say “all of the time” … I obviously mean 100% of the time (especially, of the cycle-time). Now, imagine that you are the diode(s). Since the output of the power supply needs to be pumping out 1 Ampere during 100% of the time, obviously sourced from the filter capacitors, …. How much current do you need to PUSH INTO those capacitors, if your “open window” time-frame is no longer than 3%, or even 1% of the total time available ? Guess what, as incomprehensible as it may seem, your calculations are correct. In the former case (3%), your diodes are pumping ( 100% / 3% ) * 1 Ampere = 33,3 Amperes. In the latter case (1%), your diodes are pumping ( 100% / 1% ) * 1 Ampere = 100 Amperes. Ha! Now I got you hooked and interested, have I not ? As unbelievable as it may seem, the math is unforgiving. You may not like this revelation, but you will now have to live with it. During a single conduction cycle, the diodes conduct 100 Amperes for 1% of the cycle time. After that, during the next 99% of the cycle time, they do nothing. This is equivalent to a current of 1 Ampere being pulled out of the filter bank “constantly”. 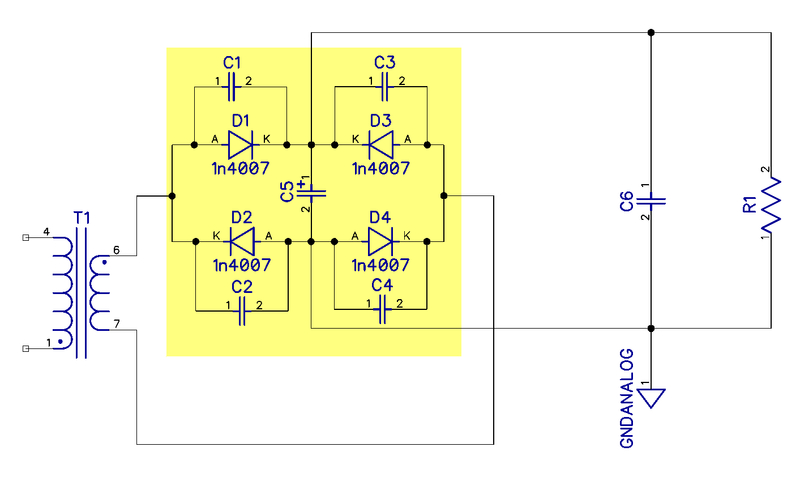 This is a visualization of the 100 Amperes route (or 33,3 Amperes, if you have a smaller bank of capacitors ….). Now, my question to you is …. Are your CABLES CAPABLE of COPING with that HUGE current of 100 Amperes ? No, I am not kidding you. And I am not asking about the “thermal” capability of those cables, because during that 1% of the cycle time, they will not melt. But what about their resistance and the limitations that it imposes ? Since we have to live with this unbelievable fact, …. maybe this is the right moment to take your screwdriver, open up that cover of your expensive amp, and check the diameter of all those cables in red, that I signaled in the diagram above. The red path is the high current path, encompassing the whole circle route: the secondary winding of the transformer, the first rectifier diode in the bridge, the FIRST (and most important) capacitor within the filter, and then the second (return) diode of the bridge, and then back to the secondary winding, to complete the circuit. Apart from changing those feeble cables that you find in your expensive amplifier…. there is not much you can probably do in terms of “shortening” or “minimizing” the resistance of the route between the secondary winding and the rectifier (unless you are ready to move the rectifier and first capacitor closer to the transformer, which I would recommend). But apart from changing the diameter of those cables into a totally absurdly thick one (fully justified !!!) … there is one other thing that you can take under your kind consideration. Consider SHORTENING the route between the rectifier bridge and the FIRST capacitor of the Filter Bank. How about shortening it to ZERO CENTIMETERS ? Sounds nice ? … and soldering it on DIRECTLY on top of the “+” and “-” pins of the Bridge Rectifier ? Kind of like making them an inseparable entity ? 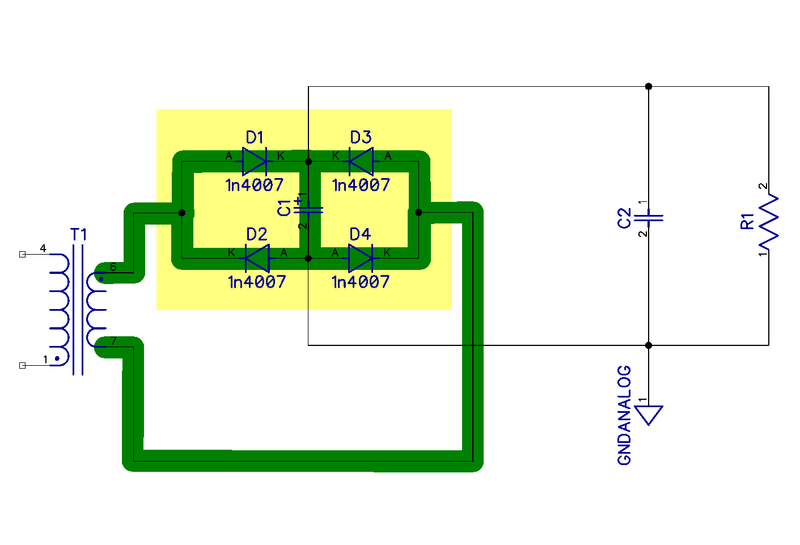 The cap should be essentially SITTING on the PINS of the RECTIFIER. (Mind you, this should be a special capacitor. One that is capable of handling high ripple currents). Every little bit helps. And this particular bit indeed helps quite significantly. Also in ways, that at first are not fully obvious or comprehendable. YES. There is another side to this coin. I am relating to an issue that is called NOISE, and electromagnetic pollution. 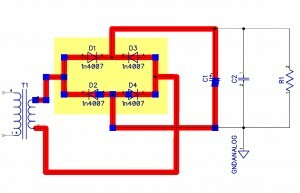 When you shorten the red route from rectifier bridge to the first capacitor, you are essentially shortening the loop of the antennae that is emitting high frequency switching noise into the insides of your amplifier. Big amounts of electromagnetic radio frequency noise. You might be skeptical and ask: But where does this “noise” supposedly come from ? 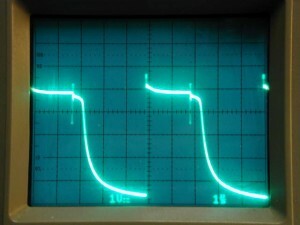 The mains frequency is only but 50 (60) Hz. Correct. The base frequency is as quoted. But …. If you jump into the role of that diode again … If you are constantly switching between conduction, and non-conduction, … well, the bad news is that there is no such thing as an ideal diode. Upon such a diode switchover, there is a small amount of time while the diode actually conducts in the reverse direction. This is the time it takes to recharge and re-polarize the p-n junction within the diode … And then, … suddenly … BANG ! the current being conducted (in reverse) suddenly hits a wall of a closed p-n junction. It is like racing your Ferrari, full of electrons, and banging it head-on into a thick concrete wall. The shock is instantaneous. The wall does NOT move. The stop is brutal. 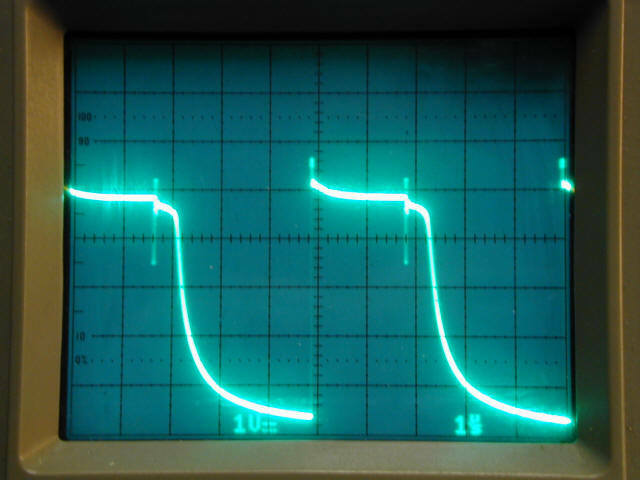 Similarily, the electromagnetic impulse that arises from this sudden “conductivity stop” is nearly vertical on the graph of the time domain, as observed on the oscilloscope. The amount of the resulting high frequency harmonics – is … meaningful. And harmful. So the less emission you achieve from a “shorter” loop of your 100 Amperes antennae, the better for you. That is also the reason, why you would wish to consider soldering that electrolytic DIRECTLY on top of the output pins of the rectifier bridge. So, we now learn that the diode is not an “ideal” one way conducting device. ATTENTION: the voltage rating of these capacitors need to be at least THREE times larger than the output voltage of the rectifier filter capacitor. This is important. Do not use voltage underrated capacitors in this location ! c). added a beefy, High Ripple current rated electrolytic capacitor and soldered it DIRECTLY on the output pins (plus and minus – please observe the proper polarity!!!) of your bridge rectifier. d). added the small little MKP / MKT capacitors, foil capacitors, in parallel to each of the diodes in the bridge, as a means of dampening the devastating impact of those nasty current spikes that take place during switching. So, now that you have finished this small little DIY modification project, I suggest you open a bottle of wine, listen to the music, and … enjoy. Enjoy a sound that now shall have much less “hisssing” Ssssssssssssssybilants. The Diana Krall …. I mean the girl in the other room … shall exhibit a totally different “s” in every word she sings, … provided that there is an “s” in that word. You will simply fall in love in those new “Esses”. It shall be an “s” like you have never heard it before. Enjoy. P.S. The article as above contains certain mental shortcuts and purposeful (and brutal) simplifications, so as to better “visualize” certain concepts, problems and issues. In my humble opinion, this simplified representation of physical phenomena is cruel, but justified, for the sake of clarity and keeping it “short”. and how we can get some “action” and quick results without the boring maths. Alas, it always is a good thing to read a book or two on electronics and stuff, just to be certain that you know what you are soldering. Have Fun !